I knew it was time to retire when I realized I had lost not only my sense of humor, but any vestige of creativity I once had. It was like there was a blockage in my brain that got worse as stress increased. My best girlfriend recommended art therapy, and my life coach and dear friend seconded that notion. With two such recommendations like that, it became number one on my Decompression List. The first question was how to start. The last art class I took was in the 6th grade. I had no idea what I should to do to reboot my creativity program. Still working part time meant painting classes would have to wait. Same with sculpting. I could already knit, crochet, tatt, and needlepoint, so that’s not what I wanted. I was a bit lost. Then a colleague mentioned on Facebook she was trying the new craze of adult coloring books as a way of relieving stress. Bingo. I found my first venture into Creativity. I found my son’s old grammar school art box, and pulled out the stubby pencils. I sat down with some paper and for two hours my brain was completely quiet. I was hooked. My bestie was enthusiastic about my new passion – so much she bought me my first set of Big Girl Prismacolor pencils and a wonderful coloring book of Cats. 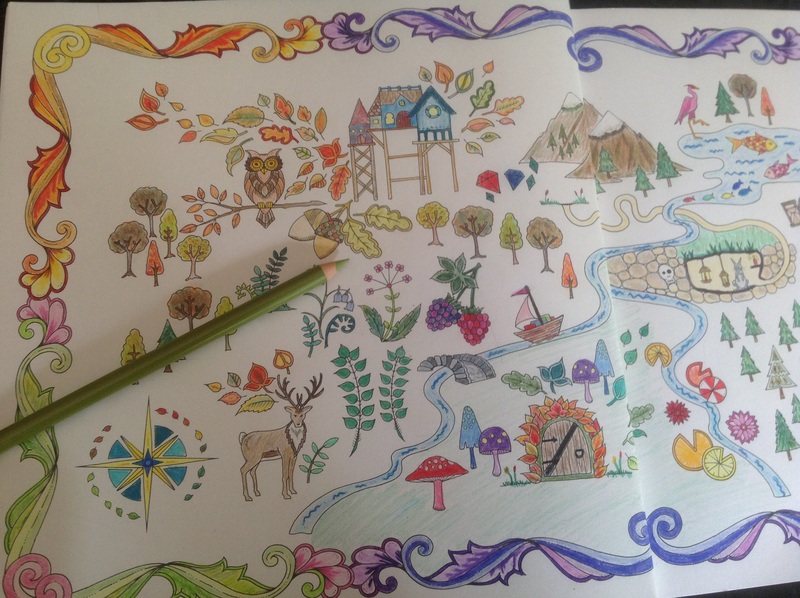 I ordered two of Johanna Basford’s books on Amazon, and I now color for at least 1 hour per day. Here’s why it works for me. Concentrating on staying within the lines, and thinking only about shading, tones and color selection turns off my racy-brain and lowers my heart rate better than anything else I’ve tried, and on a par with yoga. I am sleeping better, and longer. I’ve discovered my left hand is more accurate for coloring, but my right is faster. I am now working on increasing my speed with my left hand and my accuracy with my right. I think of it as mental gymnastics for both sides of my brain. I’ve tried markers and pencils, and realized I prefer pencils because I can control the depth, shading and tone. I have begun to experiment with blending colors and simulating texture, and it’s looking pretty good. My new love is my blending pencil. I figure this will all help me when I start painting classes this fall once I’m fully retired. Am I any good at it? No, but that’s irrelevant. The important thing is I am DOING, and it makes me feel good. I am beginning to relax, and that is the first step in the decompression process. I’m starting to really like this Thing Called Retirement. Posted in Random Musings and tagged adult coloring, art therapy, Baby Boomer, Boomer, decompression, Late Boomer, retired, Retirement, retiring. Bookmark the permalink. What a great idea! thanks for sharing. I may try this once I make the Big Move and get settled. Good luck to you! I wish I had started this years ago.